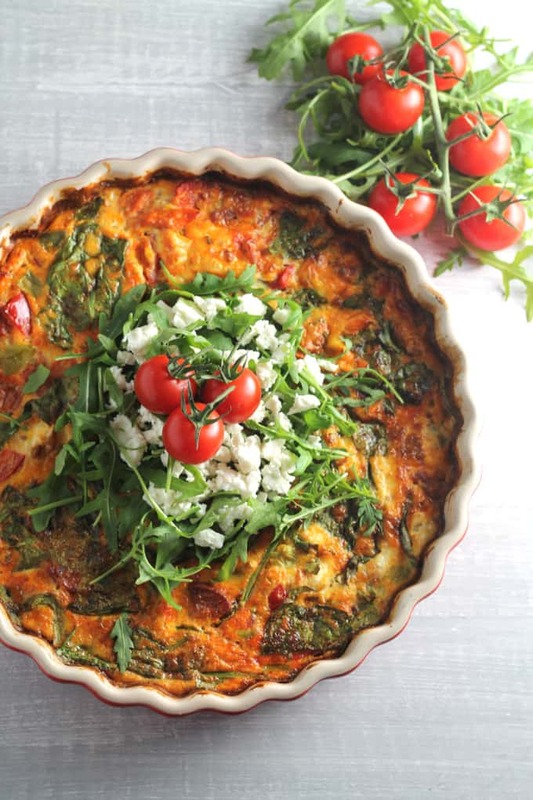 A delicious and healthy frittata or crustless quiche, made with roasted tomatoes, feta cheese and spinach. A great way to use up leftovers. Ever find yourself staring blankly into an almost empty fridge with zero idea of what to make for lunch or dinner? Yep that’s me…. more often than I care to admit! After Christmas I was determined to use up as much food in our fridge and freezer as possible as it really does upset me to see good quality produce go in the bin. My usual fall-back meals were out of the question as I had banned myself from going to the supermarket but this forced me to think a bit more creatively about what I could rustle up from a few limp bits of vegetables and other leftovers. 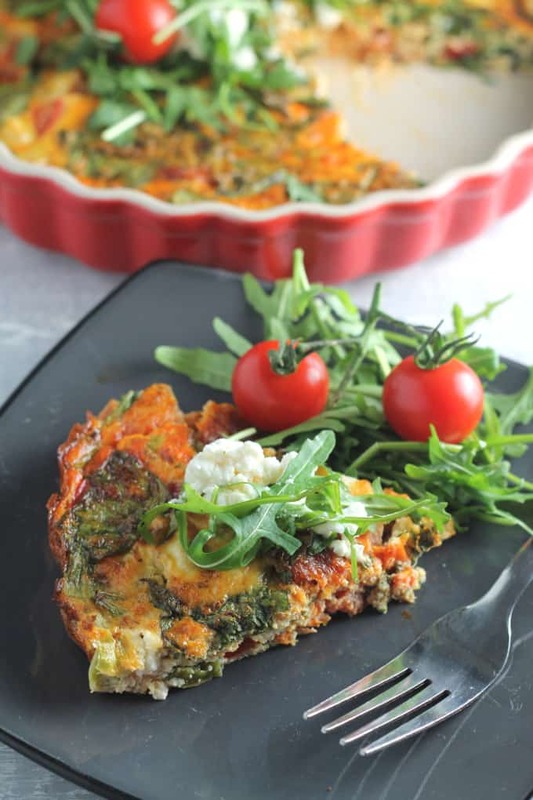 Hello delicious frittata! 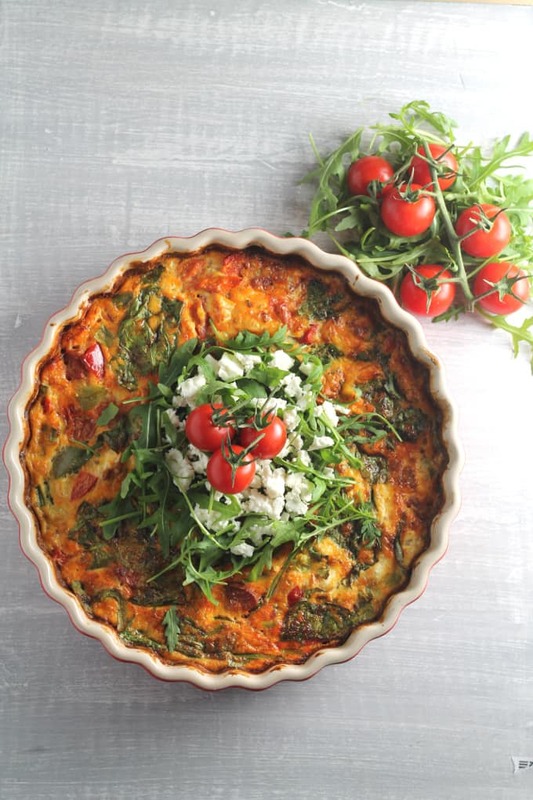 Eggs are one thing I always seem to have in abundance in my house so it really was a no brainer to whisk them up with some leftover vegetables and cheese to create a delicious and filling Roasted Tomato & Feta Frittata. I also threw in some cooked chorizo to this version. Cooked chicken, turkey or ham would work really well also if you don’t want to keep it purely veggie. Feta cheese can be a tricky one for kids as it can be quite sharp. I only used 50g in my recipe so that it wasn’t too over-powering but you could easily swap it for more cheddar or another type of cheese that your kids prefer. Similarly, the veggies are all changeable too, depending on preference or (like me!) what you happen to have in your fridge. A traditional Spanish frittata usually contains some cooked potato chunks. I didn’t have any but these would work really well also if you wanted to add them in. I really would recommend sticking with the roasted cherry tomatoes though as they add a wonderful flavour to the dish. 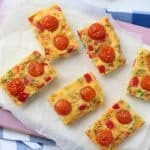 A frittata is a fantastic and versatile dish as it can pretty much be served for breakfast, lunch or dinner. We ate this as a lunch with some extra salad but you could also make a more substantial meal by serving it with crusty bread or potato salad. Yum! Add the oil and chopped cherry tomatoes to an oven-proof pie or flan dish and roast in the oven for 10 minutes. In the meantime, whisk the eggs in a large jug with a fork. Add the cheddar, feta, spinach, red pepper, spring onion and oregano and mix well. Season to taste with salt and pepper. If you want to add any extra ingredients now is the time to do so. I added a little cooked chorizo, but cooked chicken, turkey or ham would work really well too. Remove the dish from the oven. The tomatoes should be lightly roasted but not completely mushy. Pour the egg mixture on top of the tomatoes and give everything a good stir. Return the dish to the oven for 15-20 minutes. The cooking time will depend on the thickness of your fritatta. Simply stick a sharp knife into the middle to test if it has cooked through. 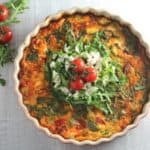 If you attempt to cut the frittata straight from the oven it may fall apart, so allow it to cool for 10 minutes before cutting into portions and serving. I serve mine with a little extra feta cheese, cherry tomatoes and rocket. The frittata will keep in an airtight container in the fridge for 2 days. 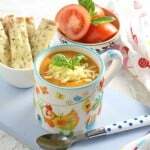 Wonderful recipe, easy to follow and with delicious results. Tha ks for sharing. Made this at the weekend as was unable to get out to the shops because of the snow and was so impressed with it bearing in mind I was basically just using up leftovers! Didn’t feel heavy wither like some frittatas and quiches are. I made this for supper this evening. My husband said it was delicious. Will definitely cook this again.it would be excellent if you are having a buffet as you could serve itcold. Hi Janet, I’m so pleased you both enjoyed it! 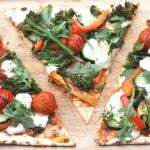 Another fab recipe- the roasted tomatoes were a particularly yummy addition! Thanks Suzanne. I do love roasting tomatoes. It just makes them taste so much better! Thanks Nim! So glad you enjoyed it. I’ve made it a few times now and still love it! I have some left over tomatoes from my kiddoes party and now I have a use for them. What fab photography too.